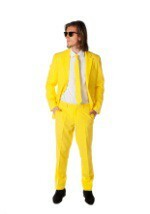 Shine like a star at your next formal event in our yellow tuxedo! This yellow tuxedo is complete with a shirt, vest, jacket, pants, and bow tie. Get a pair of our yellow socks to match and you will be the brightest one around at your next prom or wedding. This tuxedo is great on its own - or pair it with another bright colored tuxedo for a look that is sure to get heads turning!